The process of planting cucumbers usually begins with seeds. Transplants are not easily used because cucumber seedlings don't do well if their roots are disturbed. Cucumbers can be planted 2 weeks after the last expected frost in your area. The seeds generally will not germinate until the soil temperatures reach about 60 degrees F. Cucumbers are usually ready to harvest 50-70 days after planting, depending on the variety. Cucumbers are available in vining varieties and bush varieties. The vining varieties spread out along the ground or grow up a support structure, like a fence or trellis. The bush varieties are smaller, compact plants that require less space. Vining varieties typically produce more fruit over a longer period of time. 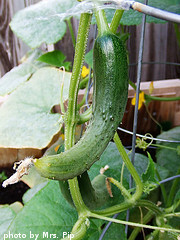 Bush varieties typically produce a few less cucumbers. 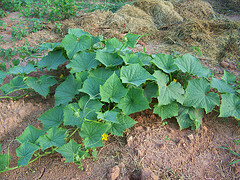 Bush varieties of cucumbers can be spaced 2 feet apart. Vining varieties should be spaced 4 feet apart. 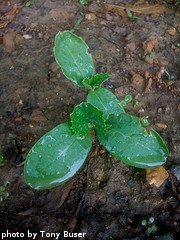 If you are planting cucumbers in containers or have limited garden space, look for bush varieties. If you are planting cucumbers in a traditional vegetable garden, begin by creating small mounds or hills. These hills should be about 1 foot across and 3-4 inches high. Use your finger or the handle of a shovel or trowel and create holes 1 inch deep. Create 2-3 holes per hill and space them a few inches apart. Drop a seed into each hole and cover with a loose layer of soil. Once you have planted the seeds, water them in well. If you want to plant cucumbers vertically, you'll need some sort of support structure. You can use a fence, trellis, or a heavy duty tomato cage. You can also construct your own support structure using 4-5 feet of heavy duty wire or wood. The structure needs to be able to support 10-15 pounds, as a couple of mature cucumber plants may have several large cucumbers on the vine at one time. Some studies suggest that cucumber plants produce better if they are grown vertically. This may be attributed to the better air circulation around around the plants themselves. If you are planning to grow cucumbers vertically, place a support structure in the center of the hill and plant 2-3 seeds around the support structure. Again, plant the seeds an inch deep and water them in well. 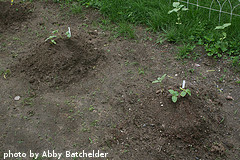 If you are planting cucumbers in a container, there is no need to create mounds. Choose a container that is a least 24 inches across and 18 inches deep. The container should have adequate drainage holes. Again, plant 2-3 seeds in each container. Plant them an inch deep and water them in well. Some folks have good results planting vining varieties in a container and using a support structure. Now that your cucumbers are planted, it's time to think about watering, fertilizing and harvesting them.